If it’s your job to oversee the QP on an industrial painting job-site, a special bulletin recently released by the SSPC may inspire an emergency meeting with your crew. Along with expanded CAS Implementation Standards set to take effect in January 2014, the report also highlights the most frequently cited audit deficiencies within the first six months of 2013. Incomplete Daily Inspection Reports (DIR), lost or missing training certifications, out-of-date technical standards, undocumented standard operating procedures (SOPs), Quality Procedures Manuals not being on-site, and companies using outdated QP checklists for internal audits all made the list. As we see it here at TruQC, these mistakes are all united by a common theme— they’re completely preventable. With your license potentially on the line, who wants to take chances on a missing piece of paper or a forgotten manual? With our Daily Inspection Report function, all entries are verified by time, date and location of entry. Pen and paper have their uses, but this sort of smart response only comes from smart software. TruQC’s Document Library feature condenses all of your mandatory SSPC documentation into the size of a single folder. That means all of your crew’s hard-earned training certificates can be kept updated and on-hand, accessible by a swipe of the finger and searchable by key terms. It means the days of filling the cab of your truck with the latest revisions of technical standards libraries and Quality Procedures Manuals are behind you. Additionally, as soon as you subscribe to TruQC’s quality control job-site documentation software, a built-in SOP feature will begin to manage document flow and allow for managerial oversight. The new checklist template builder allows you to tailor your internal audit checklists to current SSPC standards, ensuring you’re never subject to external audit as a result of an outdated checklist again. Maintaining SSPC QP standards can be the stuff of nightmares, the stuff that keeps you up at night wondering if anything managed to slip through the cracks. But it doesn’t have to be. Our software is user-driven, based on customer feedback and dedicated to easing the burden on industrial coatings contractors. Still not convinced? Check out one of our case studies below. Interested in learning how TruQC was designed to be fully integrated for your industrial painting company? 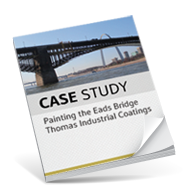 Read our case study detailing how Thomas Industrial Coatings has proven an ROI of 390%. Click here to download.